After a period of acclimatisation in the ‘shop, the legs were machined to their final size of 60mm square, after which the eight rails were shot in exactly to the length stated on the working drawing as any deviation would alter their positions relative to the holes in the table top. In order to plane the ends of these fairly thick pieces of material, it was necessary to make a bigger fence for the shooting board, using an oddment of pine. The four legs were then cramped together, marked to length and then pencil lines were drawn across all four to determine the position of the eight rails, after which all the components were dowel jointed using the ‘Dowelmax’ system. 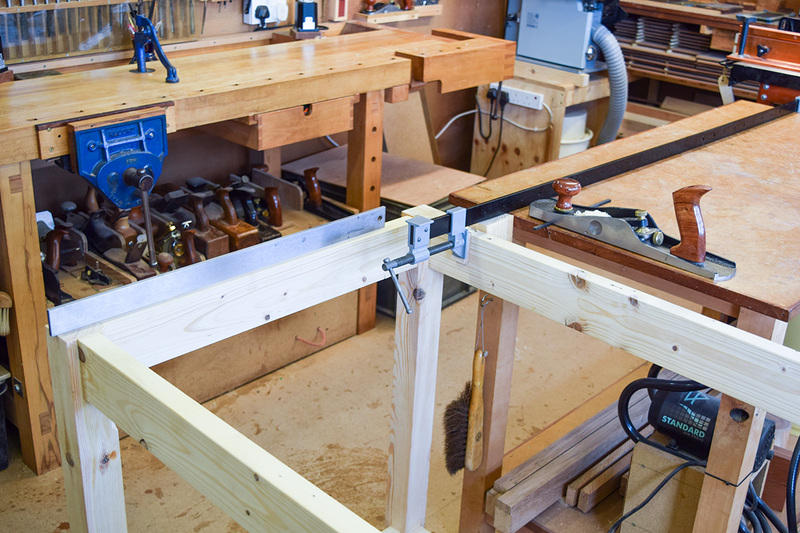 The legs were left fractionally higher than the top rails to allow for subsequent levelling once the frame had been glued together. The dowelling process is fairly rapid and once completed, the framework was assembled ‘dry’ without glue and roughly checked to see that it conformed to the specifications on the working drawing. Parf Dogs can be secured, if needed, with clamping knobs under the table and, in order to allow a little additional clearance in the corners near the legs, a small 45°stopped chamfer was machined on the inside corner of each leg (also shown on the working drawing). Using a sharp block plane the arris was then removed from the edges of all the components and the surfaces sanded with a Festool Palm Sander using 180g Mirka Abranet® sheets. 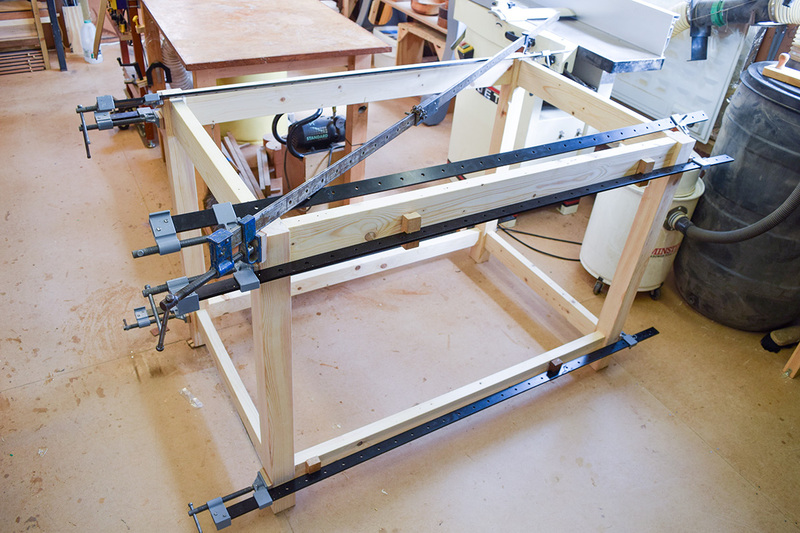 The table was glued together in three stages, starting with the two smaller end frames. I used the ever reliable Titebond III adhesive and checked the diagonals with the equally excellent Veritas Bar Gauge set. 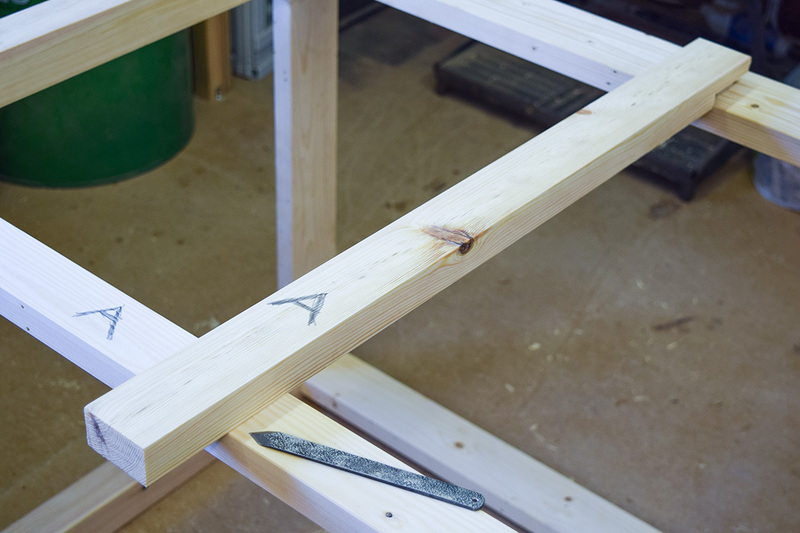 Note also that the sash clamps are slightly skewed to pull the framework square. 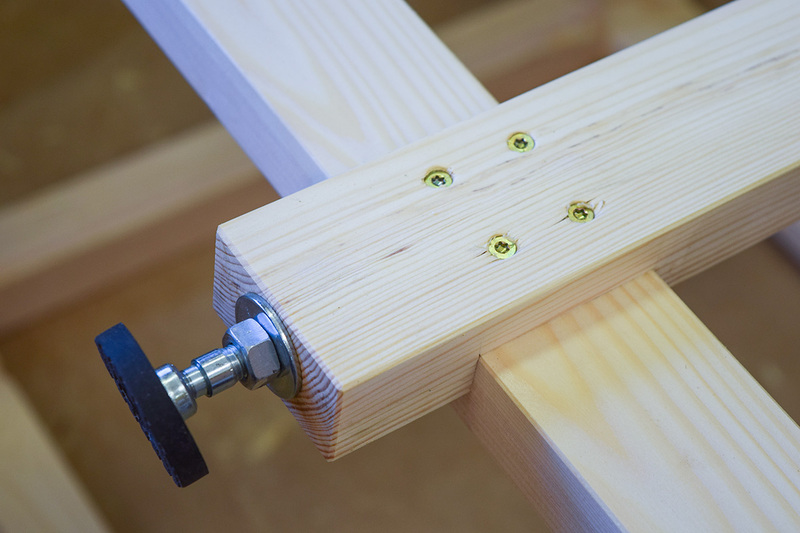 The main framework was glued together using some of our longest sash clamps which were absolutely invaluable for this job, though even one of these wasn’t long enough to pull everything square and for this I needed to use an extension bar on one of my existing Record clamps. I don’t use these clamp extensions very often, but they’re handy when I need them! 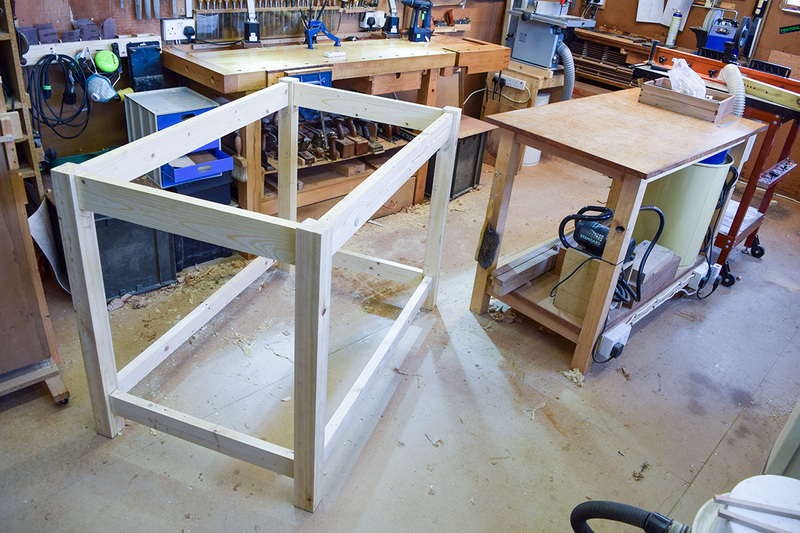 It’s difficult to check the table for squareness, but the critical area is that each of the corners is square and for this I used a large roofing square simply laying it into each corner and checking the adjacent side was parallel to the edge. Over such a long distance, it’s then easy to spot any discrepancy and adjust the frame with the diagonal sash clamp. 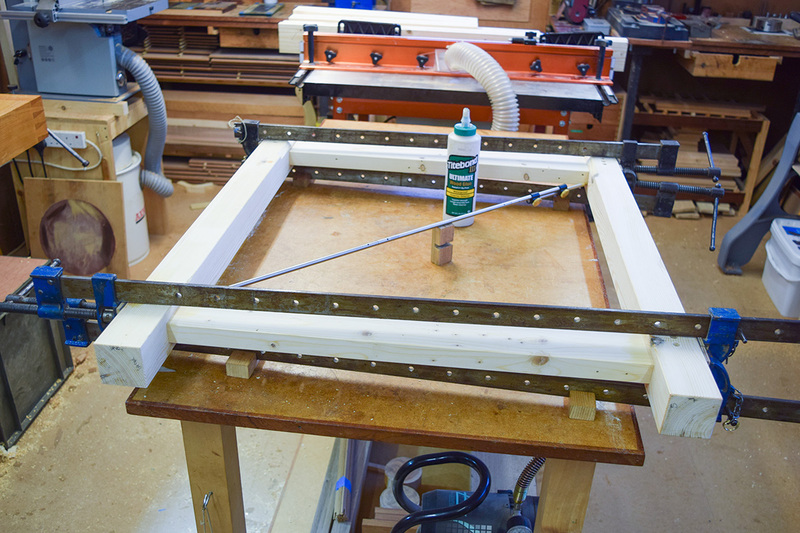 Once the glue had set, the next task was to level the corners and check that the top of the frame was straight, using a Veritas Jack and 600mm straight edge. in an oddments box. Construction was with halving joints and I began by marking each leg with a large halving joint at the end, cutting it on the bandsaw and then truing the surface on the router table. Each piece was labelled, then offered up to the framework and the limits of the housing joint marked underneath with a ‘V’ point marking knife. These marks were then transcribed on each piece to make the housing, and the waste was removed in two cuts on the bandsaw. 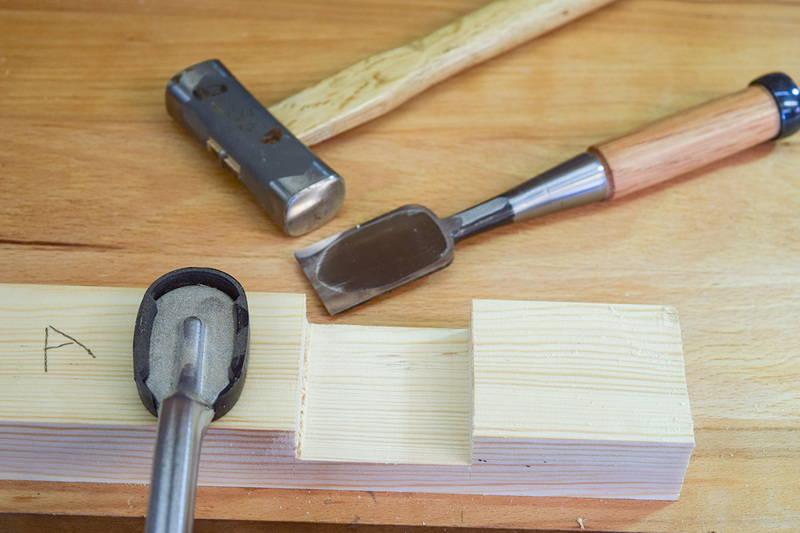 The joints were again levelled on the router table, with the cutter set to the same height and the final cuts on the knife lines to ensure an exact fit was made with a wide Japanese chisel and hammer. just deeper than the thickness of an 8mm nut, which measured 19mm across the corners, so there was just enough ‘bite’ to grip it. Once the 18mm hole had been drilled, a much deeper 10mm hole was made to accommodate the threaded portion of the foot. Each 8mm nut was cleaned with methylated spirits and then a dab of quick setting epoxy was applied to the hole and nut, being very careful not to contaminate the threads with the adhesive. 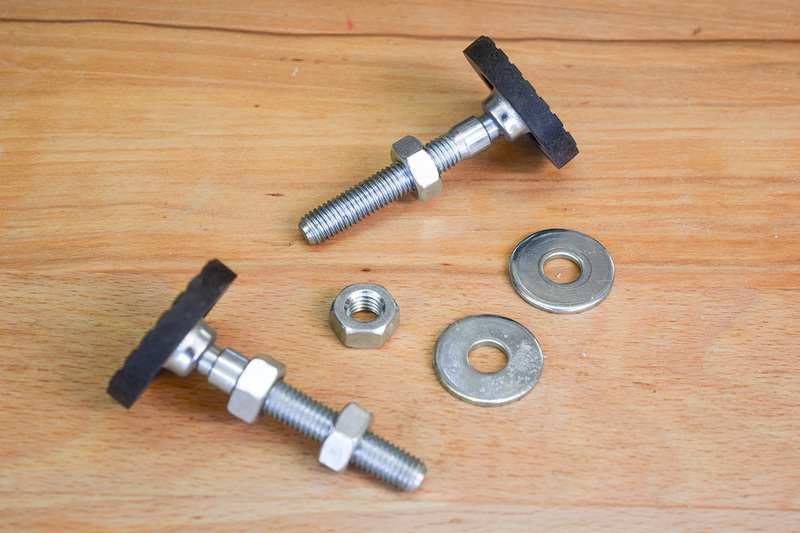 The nuts were then forced into the holes using a sash clamp and small block of wood, after which any excess glue was cleaned off with meths. To give additional support to the mdf top, I added a couple of supporting rails across the width of the top. These had to be positioned precisely according to the 1:1 scale drawing in order that they were directly between two rows of holes on the top. 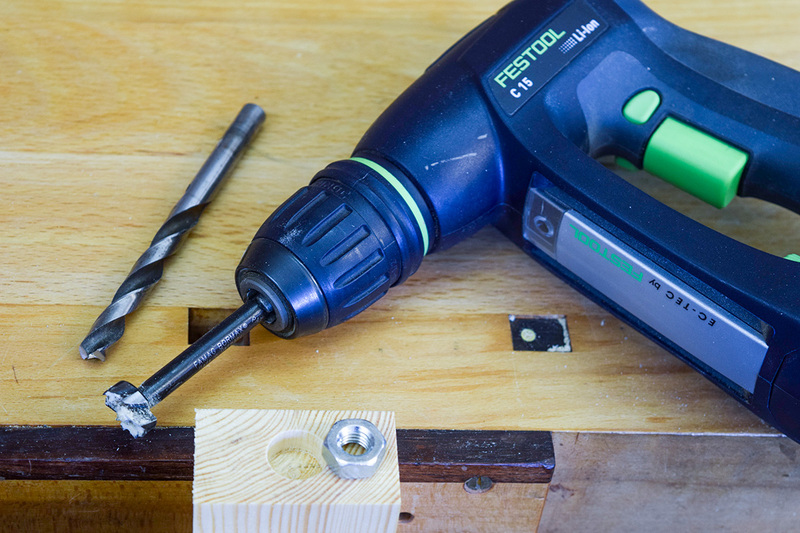 The rails were shot exactly to length and are screwed in place using 75mm Torx screws. Cross dowels were turned on the lathe from some oddments of elm to give the screw threads better purchase. 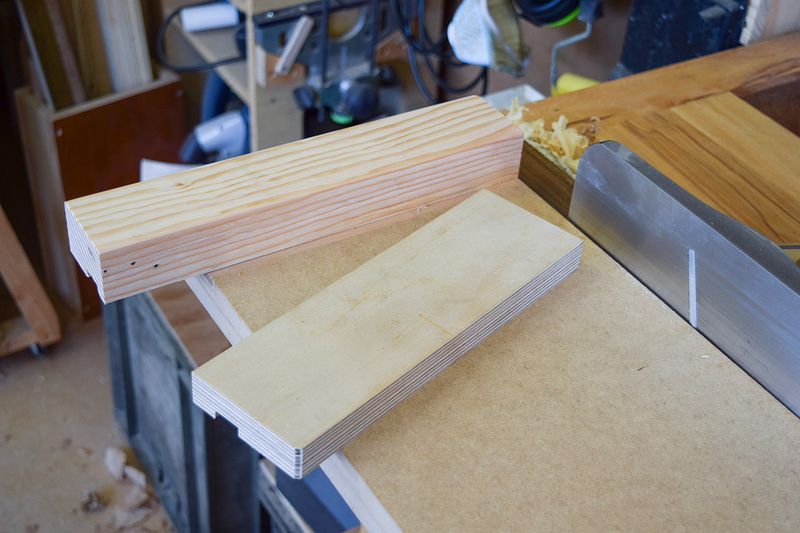 Rather than fit a solid shelf underneath, I had a some bits of material left over that could be sawn up and planed to make a slatted base across the bottom. There’s no need for them to be exactly spaced across the bottom rails as long as the gap between each is approximately the same. Having positioned them in correctly, the sharp edges were removed with a block plane and they were screwed in place with 4mm Torx screws. 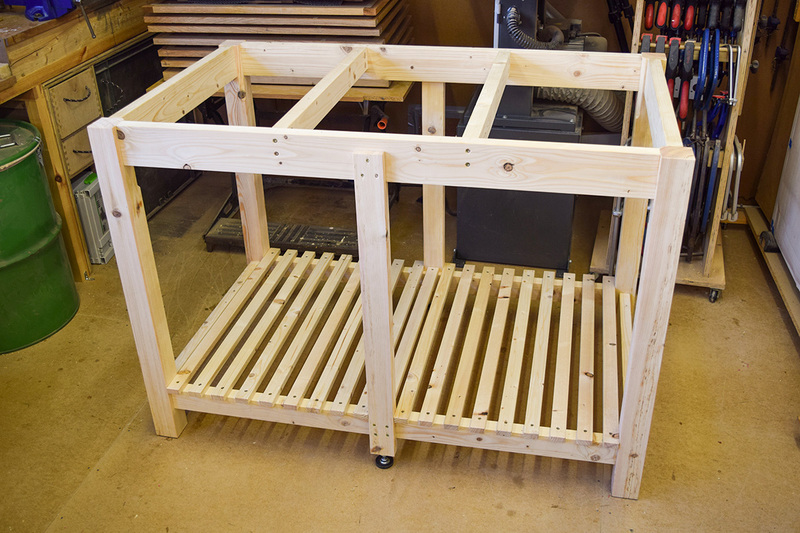 The last picture shows the completed underframe of the Power Tool Table. The final blog in this series will describe how the top and cover were made. I have a question about the position of the support rails. These have to be positioned precisely according to the 1:1 scale drawing. Which drawing are you referring to? The drawings that I see do no show the support rails. Could you help me?